The smell of the London Underground (which isn't air-conditioned) can be unpleasantly sweaty in summer. But Pernod Ricard U.K. is trying to make things more sweet-scented this week in a campaign for Beefeater Pink, the new pink variation of its Beefeater London Dry Gin. 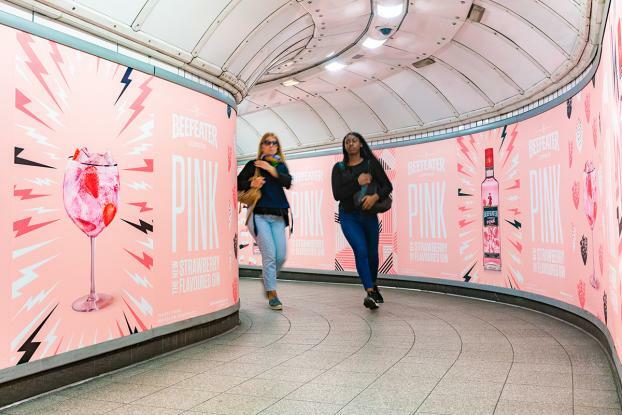 The brand installed strawberry-scented posters throughout Oxford Circus underground station as part of the launch campaign for the gin, in a campaign designed by independent agency Impero together with media partners Posterscope, Havas and Exterion. It includes four strawberry-scented exit corridors and a vinyl-wrapped escalator with escalator panels that also smell of strawberries. The "multi-sensory" two-week campaign targets millennials, who apparently "taste with their eyes" -- we just hope this doesn't translate into imbibing gin while commuting.